It doesn’t take much for a dog to become overweight. They can very easily gain a lot of weight, especially if they aren’t very active. They’re similar to humans in that way. That said, weight generally isn’t a problem for dogs; however, there are some unfortunate situations where your dog might need to put on some weight quickly. That’s almost always a situation where the dog is really sick, or even if the dog has worms. That said, you can help your dog gain weight yourself, but before doing so, make sure to take your furry friend to the veterinarian to make sure that you’ve solved the underlying problem. After all, you want to make sure that your dog stays as healthy as possible. So without further ado, follow along below, and we’ll show you the best high-calorie dog foods that you can use to help your furry friend put on some weight! Here are our top picks. 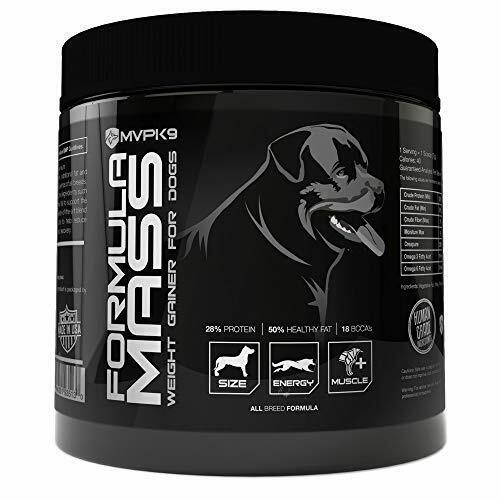 First up is a solution by MVP K9 Supplements — the Formula Mass Weight Gainer For Dogs. This one will cost you $31, but comes with 45 servings of protein-packed dog food to help your pup build muscle and gain weight. If your furry friend has been sick or is simply a picky eater, then this formula will help him or her pack on weight in a jiffy. The formula uses 40% crude fat, which can help your dog gain weight in a jiffy. You can actually see the results in just a couple of weeks after using this formula! You can choose it as a dog food replacement, or you can mix it in with your dog’s other food. 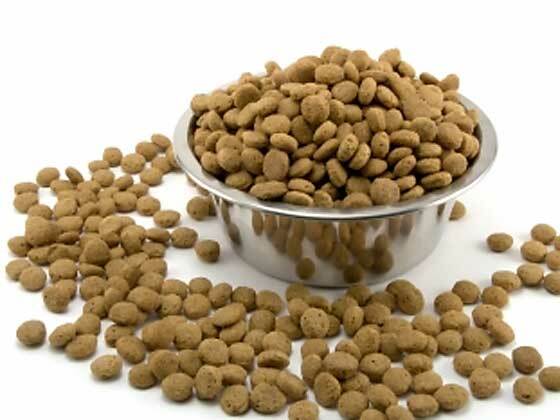 This is the most high calorie and protein-rich dog food on our list. Just one cup packs a whopping 535 calories, which will really help your pup put on the pounds. This one has a mix of vegetable and seed-based ingredients, so you’ll really give your dog a wide variety of vitamins as well. Now, you are paying for premium ingredients, so this one is a little more expensive side — a 15lb bag will set you back almost $57 whereas a 30lb bag is almost $100. It’s a bit of money, but it’ll get your furry friend gaining weight in no time. 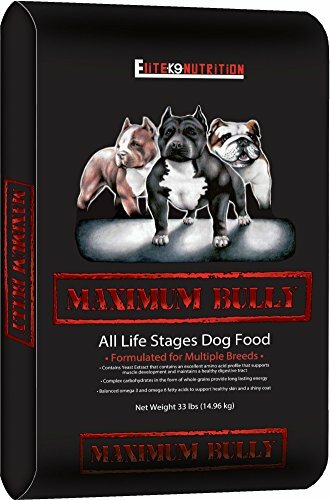 Next up on our list is the Elite K9 Nutrition by Maximum Bully. This one is packed with chicken and pork, which will provide your pup with the protein and energy needed to build muscle. 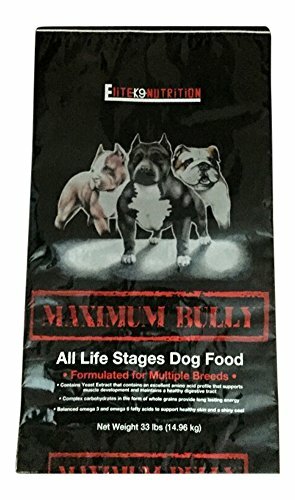 This one is suitable for all stages of your dog’s life, so you don’t have to worry about whether your pup is too young or too old. And no need to worry if your dog is picky eater — it has a taste that all dogs will love and keep them coming back for more. 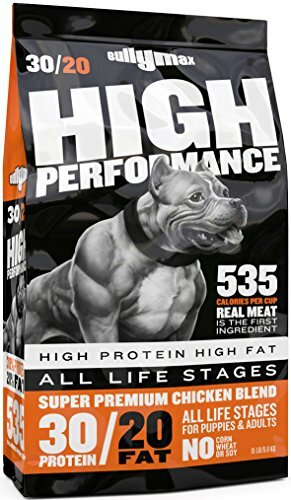 It is worth noting that the ingredients do contain menadione, which is an ingredient that some dog owners do try to steer away from; however, it does have a 32% protein and 22% fat mix and sits at 481 calories a cup. This one, as the product name implies, isn’t suitable for dogs with a poultry allergy; however, it packs the most calories on our list at 551 calories per cup. 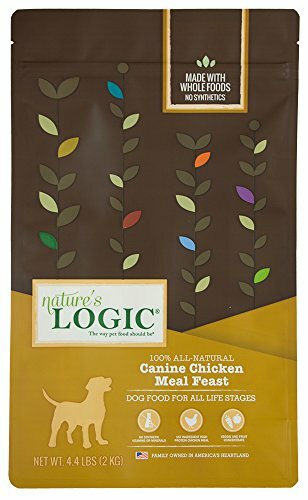 The primary ingredient is (obviously) chicken, but it does have bevy of different fruits, vegetables, and seeds to promote vitamins within your dog — this is 100% natural as well, so it’s the perfect high-calorie dog food if you’re trying to keep your pup on a somewhat organic diet while packing on the pounds. 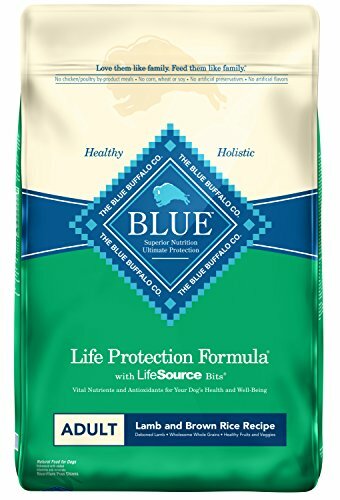 The Blue Buffalo Life Protection Formula is another high-calorie dog food, featuring about 505 calories per cup. If you’re looking for high-calorie dog foods, this is probably one of the cheaper ones on our list. 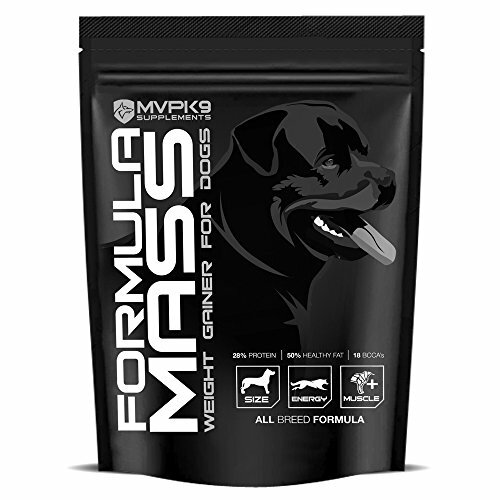 There’s a lot of different protein in this formula, so you’ll be sure to see your dog gaining good, healthy muscle after just a couple of weeks of starting your pup on this formula. There’s a couple of different recipes offered, though this particular one is a Lamb and Brown Rice mix; however, there are other options like Chicken and Brown Rice, Fish and Brown Rice, and so on — plenty of variety for those pets that are picky eaters! We’ve shown you five of the best high-calorie dog foods to help you get your dog to a healthy weight in no time. Do you have a favorite dog food for packing on the pounds? Let us know what it is in the comments section below!